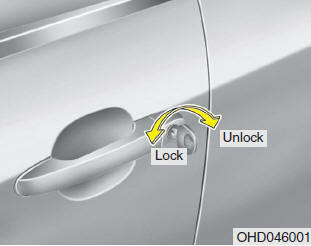 Turn the key toward rear of vehicle to unlock and toward front of vehicle to lock. Doors can also be locked and unlocked with the transmitter key (if equipped). 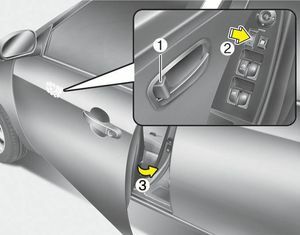 To lock a door without the key, push the inside door lock button (1) or central door lock switch (2) (if equipped) to the “Lock” position and close the door (3).